A lot has changed at Jeep since it became a part of the Fiat Group. There’s now a load of parts and platform sharing now, for a start, and the relics from the old DaimlerChrysler partnership are soon going to be removed from the Jeep line-up. Perhaps the most obvious change of them all, though, is what’s happened to the Cherokee. Gone are the bluff bodywork panels and naff cabin, with chunky plastics and an exterior that reminds us a lot of Bane from the ‘The Dark Knight Rises’ Batman film. Long story short, the current Jeep Cherokee is a far different beast to the cars that have come before. 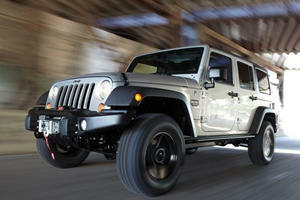 But is that enough to make this rugged off-roader one of the class greats? We have the interior of the current Jeep Cherokee to remind us of just how far the company has come since then. Remember the interiors of Cherokees of old? You know, the ones with rubbish quality plastics, fake wood veneer and an incredibly geometric design? We do, and we really wish we didn’t. But at least we have the consolation of knowing those days are now long behind us – especially when we have the interior of the current Jeep Cherokee to remind us of just how far the company has come since then. Material quality, for instance, is legitimately good, with most of the main surface areas being fashioned out of soft touch plastics (it’s worth pointing out, however, that the materials further down the cabin do feel like they’re of a noticeably lower grade). The design and control layout is also fairly good – it’s not as easy-to-use as a Nissan Rogue’s, but the control scheme itself is still intuitive to operate, with the updated touchscreen interface being quite simple to tinker with whilst driving (a feat that’s especially aided by the fact the screen is so big). Our only qualm, in fact, is with the trunk space. We’re also very satisfied with the amount of space on offer in the Jeep Cherokee. The sizeable storage cubbies are highly useful (the glovebox in particular is massive), and there’s a lot of head and leg room on offer in the front and back seats – though it’s worth pointing out that taller passengers may find their scalps scraping the ceiling in Jeep Cherokee models fitted with the panoramic moon roof. Our only qualm, in fact, is with the trunk space. With between 24 to 29 cubic feet on tap, depending on how far forward or backwards you’ve positioned the rear row of seats, the Jeep Cherokee isn’t exactly the best crossover on sale today in terms of cargo capacity – the Subaru Forester, for instance, has 34.4 cubic feet of space to play with. That said, the shape itself is broad and boxy, which is further aided by the flat load bay, 60:40 split-folding rear seats and tether hooks on the trunk side to attach items like carrier bags onto, so everything from the weekly shop to Spring cleaning-induced trips to the tip should be well catered for in the Cherokee. Plus, if you need to carry even longer items (such as...timber planks? ), you can fold the front passenger seat down completely flat on all bar the entry-level Jeep Cherokee to increase the load bay even further. The top-of-the-range Trailhawk model can comfortably keep pace with a Land Rover Discovery Sport. The Cherokee is a Jeep, at the end of the day, so it won’t be a shock to many that this crossover is a very capable machine when you take it off-road. Thanks to the drive select modes that can be toggled to suit specific terrains and road surface conditions, even the entry-level front-wheel drive Jeep Cherokees can shrug off terrain that would tear most other crossovers to shreds, and the top-of-the-range Trailhawk model can comfortably keep pace with a Land Rover Discovery Sport. A majority of Jeep Cherokee owners won’t be treating their crossover as a Baja 100 brawler, however, so having that off-road ability won’t be an important selling point to them. 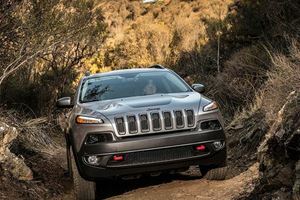 Instead, attributes like ride quality and noise refinement will be of greater significance – and we’re pleased to report that the current Jeep Cherokee’s rough terrain attributes haven’t had a major impact on the car’s day-to-day usability. The steering is about on par with what you’d find in a Subaru Forester. Though it’s not an objective class leader in any area, the Jeep Cherokee is perfectly fine for the job at hand. For instance, whilst the ride is quite lumpy at slower speeds over rougher roads, the Jeep Cherokee is more composed at higher speeds, with a smooth ride and good body movement control. Likewise, the steering is about on par with what you’d find in a Subaru Forester: light and easy to twiddle around with in more built-up areas, but quite numb and, initially at least, not what you’d call ‘confidence inspiring’. Refinement levels, thankfully, are much more reassuring. Given the bluff looks and big tires, there is admittedly a fair bit of wind and tire roar at higher speeds, but the noise insulation in the Jeep Cherokee does a good enough job of filtering out the more intrusive sounds. 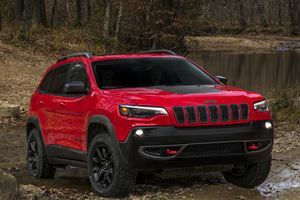 Again, it’s nothing amazingly remarkable, but it gets the job done and is more than acceptable on a day-to-day basis, so we can’t exactly be too critical of the Jeep Cherokee in this regard. However, the Jeep Cherokee is substantially heavier than the 500X and the Renegade. Remember that comment we made earlier about Jeep pinching bits out of Fiat’s parts bin? That same strategy has also been applied to the powertrain options available on the Cherokee – though, as with the interior trim bits, you do kinda need to know what you’re looking for in order to notice the similarities. Take the base 2.4-liter gasoline engine that’s available on all Jeep Cherokee variants. It’s pretty much identical to the same-sized unit in cars like the Fiat 500X and Jeep Renegade, so anyone who’s taken either of those two out for a test drive will be familiar with the characteristics of this engine (smooth power delivery, fairly hushed unless you work it hard, a nice lug of torque throughout the mid-range and so on). However, the Jeep Cherokee is substantially heavier than the 500X and the Renegade, so this 184hp engine does struggle a bit when you try to hustle it along at a brisk pace. It’ll get the job done promptly enough, and it’s certainly not a huge pain to live with, but we do feel an engine in a car of this size does need a wee bit more grunt. Regardless of which engine you go for, you’ll have to make do with a nine-speed automatic transmission. That’s not a complaint you can level against the flagship 3.2-liter six-cylinder gasoline engine. With 272hp at its disposal, this far more potent option comfortably deals with the bulk of the Jeep Cherokee, and is the far more refined of the two engines. Factor in the fuel economy figures that are surprisingly close to the 2.4-liter engine (in their most efficient guises, 22/31mpg for the 2.4 and 21/29mpg for the 3.2), and all that’s left to overcome is the $1,750 premium the larger engine has over its smaller entry-level stable mate. Regardless of which engine you go for, you’ll have to make do with a nine-speed automatic transmission. Thankfully (and surprisingly, considering we’re not amazed by the similar automatic in the aforementioned Fiat), it’s actually quite good and suits the Jeep Cherokee’s character really well. Plus, it changes gears smoothly and swiftly, you hardly get any transmission whine and it rarely holds on to gears for ludicrously long periods of time when left to deal with the gear selection on its own. For most buyers, the front-wheel drive models will be more than enough for them. There’s plenty of traction, regardless of whether you’ll be driving solely on asphalt or occasionally partaking in a bit of light off-roading, and the marginally better claimed fuel economy figures means you’ll be slightly better off in the long run by ditching the extra set of driven wheels. If you do genuinely need the off-road ability, then by all means go for the all-wheel drive models – though, if it’s a serious hobby for you and you’ve got the money to spare, go with the top-of-the-range Trailhawk model, as that’s the only Jeep Cherokee model that has mandatory serious cross-terrain features like skid plates and a low-range gearbox. Perhaps one of the biggest stumbling blocks to Jeep Cherokee ownership (unless you really need an off-road-ready crossover) is the entry price. With a starting MSRP of $23,495 that only gets substantially pricier when you pile on the options and higher trim levels, the Jeep Cherokee isn’t as initially affordable as crossovers like the Kia Sportage, Chevrolet Equinox and Hyundai Tucson. That’s not to say the Jeep Cherokee is bad value for money, however. No matter which model you go for, you’ll still get a crossover loaded with features like cruise control, hill start assist, Bluetooth connectivity, 10 airbags, a touchscreen interface and a system that helps maintain stability of whatever item you’re towing. Due to Jeep’s decision to limit the amount of options available on each trim, it’s frequently the case that you’ll need to spend more money to get incremental new features. It’s the $24,290 Latitude trim level, though, that occupy the sweet spots in the Jeep Cherokee range. On top of everything else in the Sport trim, Latitude spec also add higher-grade cloth seats, alloy wheels, a reversing camera, a fold-flat front passenger seat and a deliciously tactile leather-wrapped steering wheel. Add in the £895 Safety/Convenience Group package (which includes a power-adjustable driver’s seat, an uprated sound system, rear parking sensors and a blind spot monitoring system), and you’ll have yourself a fairly well equipped Jeep Cherokee that won’t break the bank. That said, it’s possible to really spend big bucks on a Jeep Cherokee – especially if you crave lots of high-end features in your car. Due to Jeep’s decision to limit the amount of options available on each trim, it’s frequently the case that you’ll need to spend more money to get incremental new features. Want the most cost effective way to get leather seats? You’ll need to spend $29,000 on a Jeep Cherokee in Limited trim, then. Desire built-in navigation and an electrically-adjustable front passenger seat? You’ll need to spend nearly $35,000 on the Overland spec. 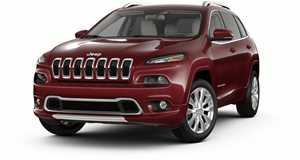 At least residual values are fairly strong (if not outstanding by class standards), and the array of standard-fit safety equipment does at least mean the Jeep Cherokee is a safe car regardless of which version you end up selecting. We really do applaud the Jeep Cherokee in many ways. There’s no denying it’s a substantial improvement on the old Jeep Liberty it replaces, and it’s a very capable crossover when analysed in isolation. Plus, it has the benefit of being the only car in this class (albeit only when specified in Trailhawk spec) that can out-off-road every other mid-sized crossover this side of a Land Rover Discovery Sport. When cross-examined with every other crossover it’s facing up against, however, the Jeep Cherokee does start to falter a bit. Given there are quite a few other cars out there that surpass the Jeep in terms of practicality, fuel economy and on-road manners, we struggle to come up with a conclusive argument in favour of choosing the Cherokee over everything else this segment has to offer. By all means, check the Jeep Cherokee out. As we’ve iterated many times, it is a good and capable car that’s more than up for the task at hand. We just feel you should look at other competitors first before deciding whether or not the Jeep Cherokee truly is the crossover for you. No longer do we have to be visually assaulted by the hammerhead shark lookalike from Jeep. Contradictions, to say the least.